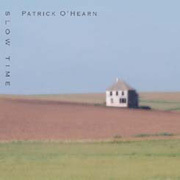 There are certain signature sounds that give away a musical composition as one by Patrick O'Hearn. The wooden wavering sound of his sparse piano playing, the perfect entwinement of his writhing bass lines and pulsating percussives, his knack for integrating elements of recognizable sounds into a unique synthetic voice, all moving beneath an adorning cloud of reverberation, are but a few of O'Hearn's innovations. Upon first listening, his album Slow Time (44'17") may seem to be a bit of a departure from what he is known for. As the title implies, the 8 tracks are quite introspective and are indeed explorations of "slow time"; and not of the more Prog-Rock infused principles of his early releases. But insightful fans understand that Slow Time is based on themes and concepts that are actually present in O'Hearn's more energetic music, now clearer and more distinct minus the complexities of composition and engrossment in virtuosity. This album is relaxed, nearly Ambient, and in places overtly electronic, all while maintaining its unique warmth. By concentrating on presenting only a few levels of sound at any given moment, O'Hearn is able to create spacious and intelligent music. While this music may be considered atmospheric, it is by no means static. From an ever-evolving latticework of sequence patterns, to layers of dark churning drones and bright swirling accents, to breath-slowing and body-swaying drum and bass, O'Hearn's sonic designs are in constant motion. This music would die from overcalculation. Slow Time is engaging and listenable without being simplistic.